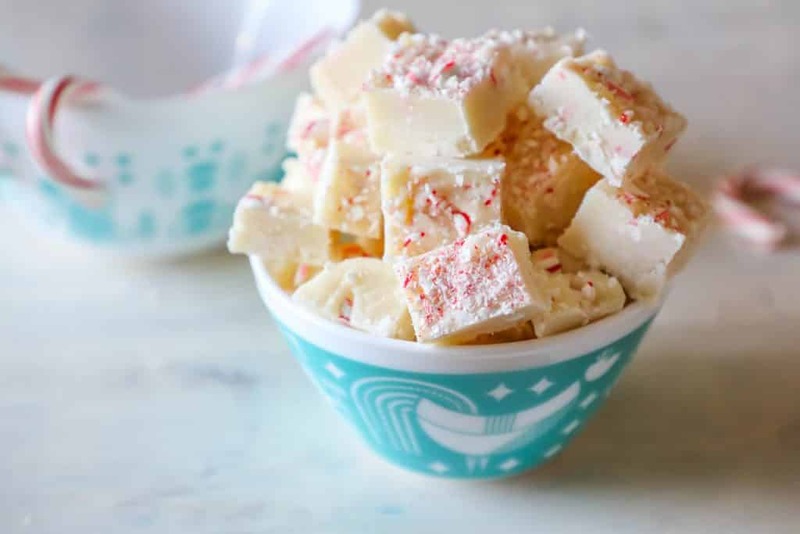 This Cake Batter Candy Cane Microwave Fudge is simple, delicious, and so good – just a few minutes prep for this no-cook fudge full of holiday cheer! I’m so excited to finally start holiday planning and cooking – the second November rolls around every year, I can’t wait to get started making delicious treats, decorating our house, and finding fun festive things to do with my family. 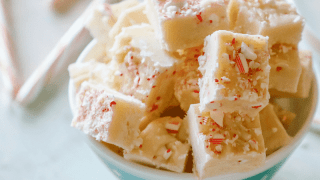 I generally travel to the European Christmas markets in December, so I try to get as much done ahead of time as I can for the holidays – and this fudge is a perfect teacher and neighbor gift to create with your kids and freeze early! 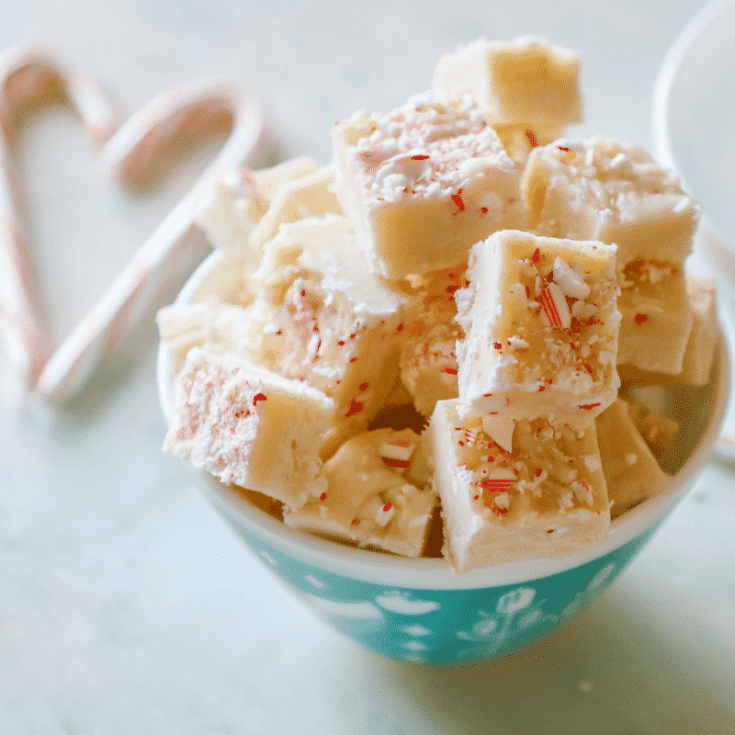 This Candy Cane Cake Batter Fudge recipe is the perfect pre-made Christmas gift – all you need is your microwave, and I have some great tips and tricks for storing it to keep it tasting fresh for holiday giving! Fudge is one of my favorite things to make and give during the holidays – especially because it is so easy and really cute to display at parties. Who wouldn’t want to dive face first into a huge pile of this whimsical fudge? This fudge is seriously the standout star of any holiday party. It’s so tasty, but also crazy easy! 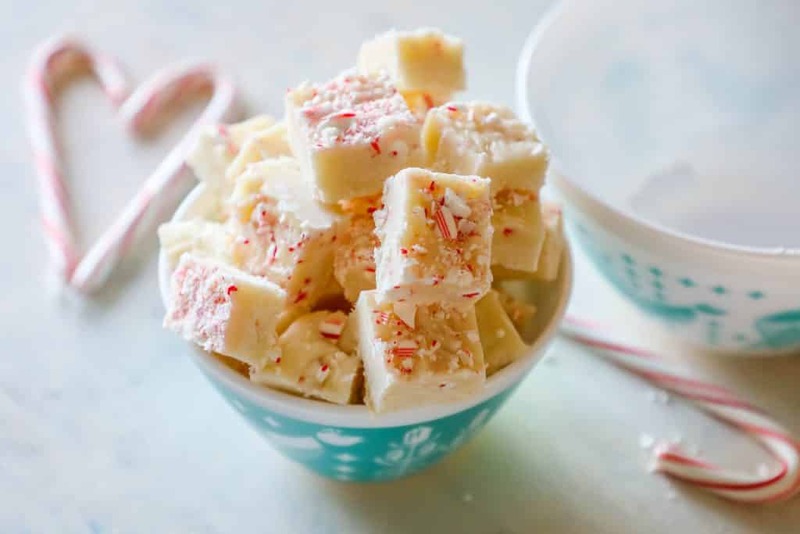 Just Take Me To The Cake Batter Candy Cane Microwave Fudge recipe already! 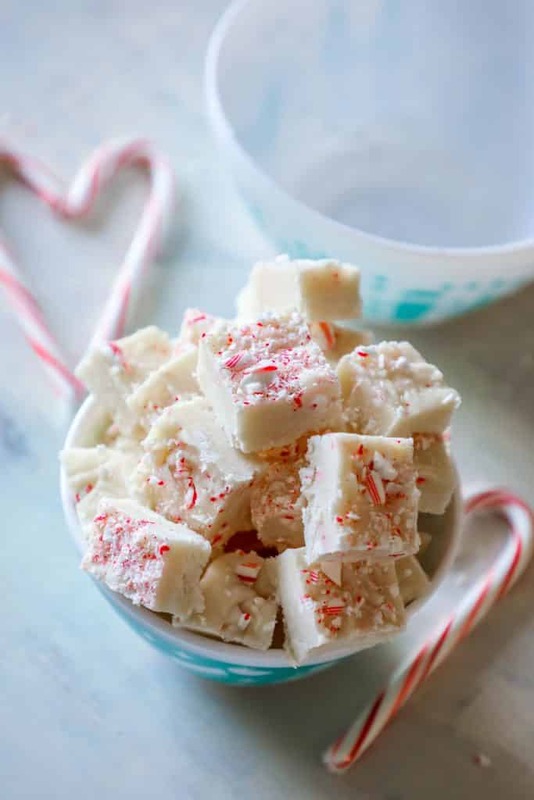 If you’d like to skip my helpful tips and tricks and get straight to the easy candy cane fudge recipe, please scroll to the bottom of the post, just above comments, where you will find the easy printable recipe. I get a lot of comments and questions on my posts, so I try to provide as much information as possible for my readers. If you’d like to skip all that, please simply scroll to the bottom of the page. -If making ahead of time, keep fudge in one large sheet in the freezer, in a tight bag with no air bubbles in the freezer, for up to 3 months. -I actually like to keep it inside two bags – one that has all the extra air pushed out, and one over that bag to help prevent freezer burn. -Do not slice fudge into squares until you’re going to give it away or eat it – this helps prevent it from drying out. -Store uneaten fudge in an airtight container in a cool, dry place for up to 1 week; or 2 weeks refrigerated. Cake batter fudge is one of my all time favorite recipes – since it is so effortlessly easy. When making cake batter fudge, we’re taking out all of the tedious boiling of fudge and using boxed cake mix as the base to the fudge – so the fudge tastes just like cake batter! It is a trick that is fabulous for quick and easy fudge that is much faster than traditional fudge recipes – simply add the ingredients, microwave, mix, and let cool! It really is that easy – thanks to using boxed cake mix! -Press down hard, and break it apart! While this cake batter fudge recipe is incredibly simple, there are a couple of tips to help you get the best fudge everytime. Since we’re using storebought cake mix for the base of this easy fudge, it can respond differently for each person, especially in dry or moist climates. If your fudge seems too thick, and the cake mix has soaked up too much moisture, simply thin the mix with a teaspoon of milk at a time to get it to the perfect consistency. Fudge consistency should be very thick – but able to be manipulated with a spoon. Fudge is easiest to cut, handle, and enjoy when it has been completely cooled – don’t rush the cooling process and let your fudge set. For best results, you don’t want any lumps of cake batter in this fudge, so be sure to stir well to mix completely. 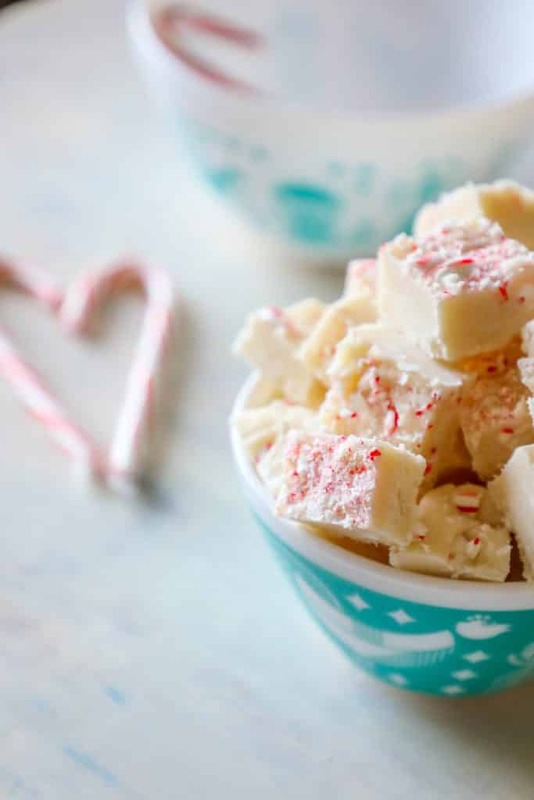 This fudge is perfect for Christmas – and topping it with candy canes only makes it even more fun and festive! To get the best results, I add the candy cane topping right when I put the warm fudge in the pan, before I cool it. 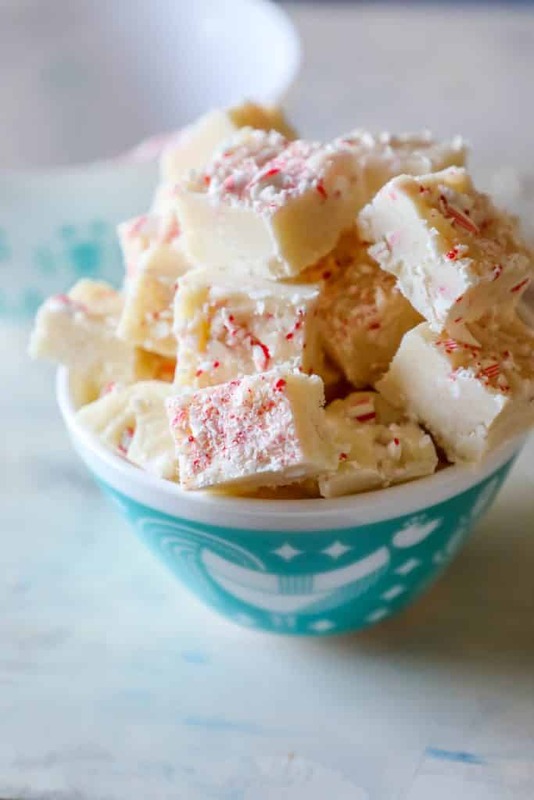 Slightly press the crushed peppermint candy into the top of the fudge, so that it will set into the top instead of slide right off. 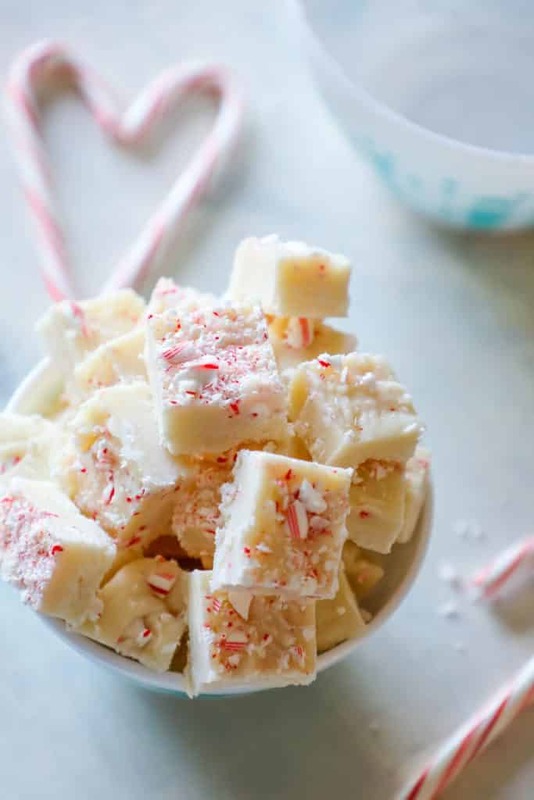 If you love this easy Candy Cane Cake Batter Microwave Fudge Recipe as much as I do, please give it a five star review and help me share on facebook and pinterest. 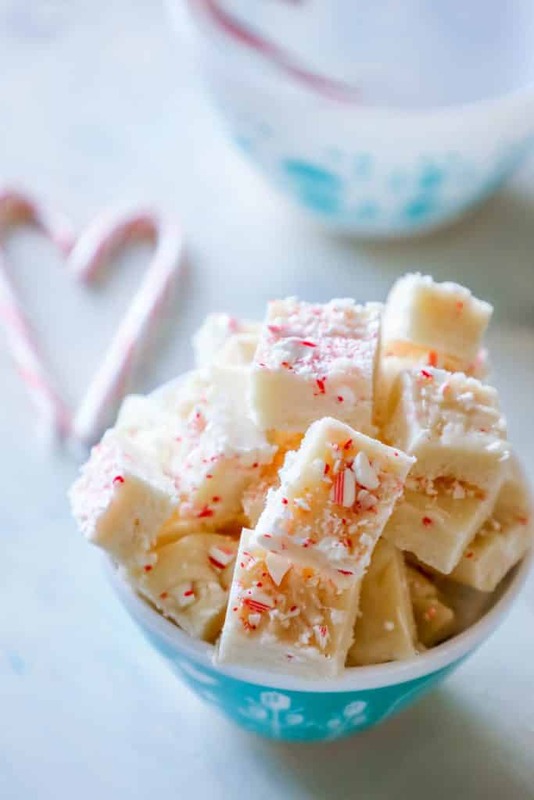 This Cake Batter Candy Cane Fudge is simple, delicious, and so good - just a few minutes prep for this no-cook fudge full of holiday cheer! In a large bowl, add cake mix and sugar, mix. In a medium sized bowl, add butter and almond bark. Microwave for 30 seconds, stir, and kee pmicrowaving in 15 second bursts until mixture is melted. Add milk to melted candy bark and butter, stir well. Add liquid ingredients to cake batter and powdered sugar. Stir well until there are no lumps. Stir in crushed candy canes. Pour into 9x9 casserole dish lined with parchment paper or foil OR use a silicon dish. Let set for 3-6 hours in refrigerator, or 1-2 hours in freezer. Cut into small bits, or leave as one big chunk if making ahead of christmas and freezing. I’m using white chocolate chips, would that still be 1/2 cup? Looking forward to trying this recipe out! I used 1/2 cup of white chocolate chips and it turned out great! Thanks for the recipe! Is 2 cups of cake mix equal to one box?